Appearance: Pours a nice two finger white head with ok lacing. Color is a light gold with a cloudy complexion. Smell: Citrus hops with notes of pine and a bread-like malt sweetness. Very appealing. Initial Taste: Tastes like an IPA (India Pale Ale). Strong flowery hops up front with not much of that citrus like we noticed to strong in the aroma. The flavorful hops are somewhat balanced with a sweetbready malts. While you can taste the sweetness of the malts this is by far a very hoppy beer. Thoughts: Another amazing beer from a can! 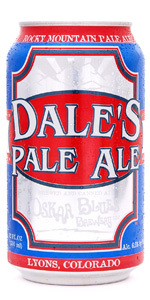 The guys over at Oskar Blues have done a great job of changing the way people think of canned beer. This one is no exception. It’s a flavorful beer that is packed full of complex hop flavors. This is definitely not for the hop-shy beer crowd 🙂 but as far as Pale Ales go…this one is a winner. I highly recommend this beer to all you IPA and Pale Ale lovers out there. Don’t Fear The Can!